We've always sort of seen cheesecake as a dessert fit for the gods. It's magical, heavenly, divine. And it turns out, it sort of was created for the gods. Way back in the day, in ancient Greece, cheesecake is said to have been served to athletes during the first Olympic Games. Quickly, the Romans jumped on the cheesecake bandwagon and eventually, the rest of Europe (and then the world) did too. 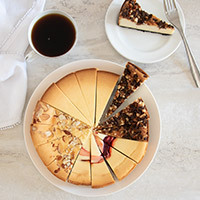 As this delicious dessert spread all over the globe, variations of recipes were created and evolved into all the delicious flavors we have today. 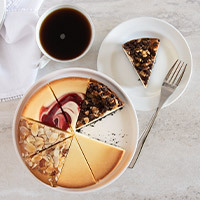 Our Standard Cheesecake Sampler celebrates cheesecake's past by uniting different tastes from around the globe together, so there's something for everyone in your party.